Mix-N-Match any flavor of dill pickles or relish. From Tom Keen of Mesa, Arizona on 7/19/2018 . Best pickles ever !!! Wish they were sold in stores out here ! DEVILED EGGS,HOT DOG. BRATS AND POTATO SALAD WOULDN'T BE THE SAME WITHOUT SWEET PICKLE RELISH ! From Martha of Holly Springs, North Carolina on 2/2/2018 . I use Sechler's sweet pickle relish when I make my Grandmother's recipe for homemade ham salad. From George Stewart of Norwood , Ohio on 1/23/2017 . From Nancy Saenz of Fort Worth, Texas on 12/17/2016 . I haven't tried all the pickles I ordered yet, but I can always depend on Sechler's. I gaave a jar of sweet orange chunks to a friend who is unfamiliar with Sechler's, and her evaluation was that they are the most delicious pickles she ever tasted. 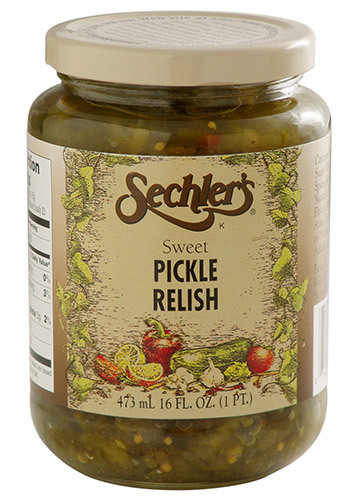 I became familiar with Sechler's when I lived in the Irvington community in Indianapolis and did a very successful fund-railing project with your pickles.